25, of Jamestown, Pa.; assigned to the 3rd Battalion, 172nd Infantry (Mountain), Maine Army National Guard, Brewer, Maine; killed May 6 when an improvised explosive device detonated near his M1083 cargo truck during combat operations in Diwaniyah, Iraq. Also killed was Staff Sgt. Dale J. Kelly Jr.
To honor David, his father Ron Veverka with the help of his family chose this stone from the Pymatuning State Park in Pennsylvania. 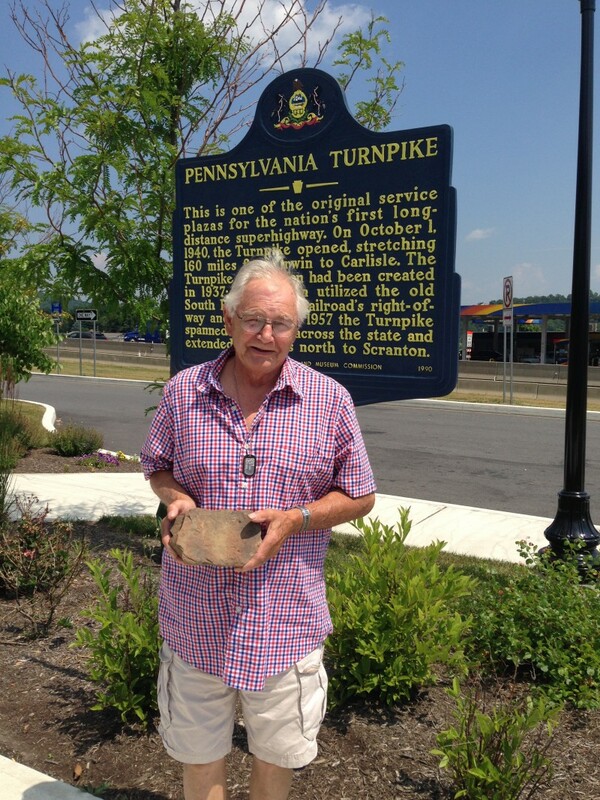 We met at a historic rest stop on the Pennsylvania Turnpike in July 2014. Pymatuning State Park is literally where David grew up. He went to the beach there, he attended summer camp as a youth, he spend his childhood there. It is the biggest state park in PA and some of David’s best childhood adventures happened there. It is where David was first exposed to the outdoors and where he first found his love for hiking and kayaking. When not on the water, you could ALWAYS find David’s kayak strapped to the roof rack of his truck. He just loved to kayak and there is a great story where David was kayaking along the coast of Maine and he found a distressed baby seal that fell in a the crevice of a rock. David not only rescued the seal baby, he returned it to his mother, and saw the mother seal literally clap her flippers in appreciation and joy. For a while David loved hunting. That passion changed after his first assignment as a Wildlife Biology student where he was tasked to trap field mice. He was so touched by these beautiful creatures, he sent all his hunting rifles back home to Maine — he quit hunting on the spot. David excelled in Marine Biology and was chosen to study in Marine Biology Labs in San Diego, CA where some of the best research is performed in the country. David loved dark beer and as a UMO student, you could usually find him at the BEAR BREW in Orono, ME spending time with his friends and classmates. David was a classy guy, loved and respected by so many. You might have heard David share a story about his high school days as a Basketball player in Jamestown, PA where his team NEVER won a game. But you would certainly not hear David share that after being a star basketball player, and top scorer on every game, while a member on that same losing team, his coach retired his number! David was very near his UMO graduation when his Maine Army National Guard unit was activated. He was scheduled to graduate in May 2006, but instead he and his unit were activated in Jan 2006, and they were in Iraq by March of 2006. Just a few months later, in May 2006, he died from the convoy IED blast that took his life and the life of SSG Dale Kelly. He was only 25 years old. David was proud to carry on the legacy of veterans in his family. David’s fraternal grandfather fought in the Battle of the Bulge in WWII and David’s father, Ron, fought in Vietnam from 1968-1969. David felt so inspired by the patriotism in his family, he joined the Army where he excelled in the military service. He was selected to be a member on a prestigious Drill Team and loved every aspect of wearing the uniform. I am honored to be carrying a stone for such a kind and gentle soul. In carrying David’s stone, I was given the gift of a window into the souls of many brave, strong, kind and giving people who carry the pain of loss each and every day. As one of the photographers for our team, during the hike I had to be focused on the task of capturing the day’s events. My reflections came as I looked at the images afterwards. The suffering and strength of the families and friends who lost loved ones brought tears to my eyes. They still do each time I look at them. What resounds in my heart most is how each person held their stone. It was their most precious belonging, the soul of their son, their husband, their brother. They held it with such care and dignity and gentleness. I am deeply appreciative and honored to have carried David’s stone, as David was one of this incredible family – kind, loving and selfless. Thank you, David, you are forever living in my heart and the hearts of many others who now know your story. I had the opportunity to carry Dave’s (SSG David M. Veverka’s) memorial stone during the Maine Marathon Tribute March this October. I wanted to write a few words to express how Dave lives on in the hearts of his fellow Soldiers. I was a classmate of Dave’s at Orono and we attended ROTC together. We were also both Infantrymen with the Mountain Infantry Company in Brewer and were good friends. I would say that we also drank a substantial amount of beer together and I certainly enjoyed his company. In 2006 after college, I deployed with Dave to Iraq and he was one of my NCO’s in my first assignment as a Platoon Leader. He had decided to get out of ROTC and I was happy to have him since I knew he was competent and trustworthy. He was a guy I was not concerned about; skilled and well liked by his Soldiers who thought the world of him. I won’t get into the details of his death but suffice it to say that he saved the life of his gunner in a split second action. On a bad day, the only stroke of luck was that Dave happened to be where he was and saved a young Soldier at the last possible second. It was a remarkable, skilled action that only someone like Dave who took his training as seriously as he did could possibly have executed so flawlessly. On October 5th I had a chance to recognize Dave’s sacrifice during this year’s tribute march which follows the route of the Maine Marathon. The years have passed as they do and I now command the Mountain Company. I took a group of the guys and our company guidon along for the 26.2 mile march. We carried Dave’s memorial stone as well as SSG Dale Kelly’s stone because they are our fallen Soldiers and we certainly don’t forget their sacrifice. I carried Dave and I let the boys fight over who carried Dale and the unit guidon. We secured our packs, fueled up, and stepped off well before sunrise along the Back Bay path out of Portland. Looking back, the march was difficult but not overly hard. We had excellent weather and it was the perfect temperature, cool but not too cool. It was sunny and we were all in great spirits. I thought many times throughout the event that Dave would definitely have volunteered to attend if he were still with us. He would have also enjoyed the fact that his stone is a bit larger than the others and as a result found a way to dig into my back nicely. He always enjoyed making light of the pain imposed by the Infantry profession. Because of that, I know he also would have enjoyed laughing at the guys after the march about the raw feet and shoulders that many of us gained. At the end I saw the real meaning behind this march for me. Maine heroes are not forgotten because they still live in our hearts. Opportunities like this do not tear open an old wound. They remind us how special our fallen friends are and how their journey is now ours. I am happy for the opportunity to remember our fallen Soldiers and it is refreshing to see so many people invested in this project. Thank you for expressing how this soldier lives on in our hearts. Each one of these stones tell a soldiers story. Thank you for sharing his story. I am so proud that you honor Dave I miss him ! On November 14, 2014, I was honored to carry SSG David M. Veverka’s stone up Bradbury Mountain for the Summit Project with my school. Before I went on this hike, I read everything I could about David. The best thing I read was that he played basketball in Jamestown, PA and never won a game. That was my favorite thing because I feel like his team didn’t give up because they hey were determined to carry on. The day I climbed this mountain with my school, was not only a day of remembrance for the fallen veterans, but also because that day was the third year anniversary of my baby sisters death. It was a tough day for me, but eventually I got through some pain from my sister and was able to focus on what I was there for. Your son, SSG David M. Veverka. As I climbed the mountain with a close friend, I grew tired quickly and even ran out of breath. I tried imagining what it would’ve been like to be climbing mountains for 12 hours a day in 90 degree heat, and couldn’t. Growing tired and losing breath, it was difficult to focus on much of anything. The day we went up the mountain, it was only 30 degrees outside. Even with jackets on, people were still cold. David Veverka died too young. His hard work and dedication for his country was strong, and I believe that that’s what truly mattered. Even though I didn’t know him in anyway besides through the information you provided, I believe he was a great man and I wish I would’ve gotten the opportunity to meet him. I am terribly sorry for your loss. I am Dr. David Jones, a Professor at the University of Southern Maine. On March 6, 2015, I was honored to carry SSG David M. Veverka’s stone through the streets and trails of Portland, Maine. Although I never had the privilege of meeting David, after reading his story I feel a close affinity for him. Like David, I am an avid kayaker and outdoor person. I appreciate David’s love for nature and wildlife. David’s story about how he rescued a seal baby and then returned it to its mother profoundly touched me. This story provided me insight into his caring and loving soul. I also greatly appreciated the transformation that occurred within him when he was tasked to trap field mice. As an educator I recognize that students’ learning occurs not only at the intellectual level but also affects emotions and spirit. Half-way through the Project Summit group’s hike through Portland, we stopped at a memorial that overlooked the seacoast. As I looked out over the calm ocean waters, I envisioned David kayaking off to a distant island or just sitting in his kayak watching the harbor seals frolicking about on the ledges and rocks. I am honored to have carried David’s stone and to have the precious opportunity to connect with his spirit. He was a loving and caring young man and his memory and spirit live on. My name is Andreja Lupo. I’m 16 and I’m in the Nokomis JROTC and on the 29th of May we went on a hike up Mount Bigelow while hiking the mountain I thought about a lot of things. Firstly I thought about the weight I was carrying an how he carried the weight of our country on his shoulders, Every time I went to complain about the weather or about being tired I stopped myself and imagined how much SSG Veverka would have enjoyed the hike. It took us 11 hours round trip to hike the mountain. I have asthma and was having a hard time carrying my pack, I had to take many breaks but it was worth it. I chose SSG Veverka because I enjoyed the story about him saving the baby seal. As I read through his bio I noticed how much he loved animals, I myself love animals. Thank you for honoring David yes we were so proud of David. Yes he loved to work with wildlife we miss he him so such Thank you ! My name is Tony Llerena and on Sunday, May 24th, 2015, I had the distinct honor of carrying SSG David Michael Veverka’s memorial stone up the Owl Mountain in Baxter State Park. I can truly say that the preparation for this mission and journey have humbled me to my core. I have been agonizing over what exactly I could say in this letter to you that would even compare to the sacrifice you have given and honestly I just don’t have the words. What I can say is that everyone I have spoken to who knew David has confirmed one thing, David was an exceptional human being. Some of the stories I read or heard ranged from being thoughtful and sending his Mom a Mother’s Day card while deployed, to making sure his friend celebrated his 21st birthday, to saving a fellow soldier’s life for his final act on earth. I have the privilege of working at the University of Maine, David’s alma mater, as the Coordinator of Veterans Education and Transition Services. The men and women I serve are among the best I’ve ever known. I mention this because I never had the privilege of meeting David in person and I would most certainly consider him among them. I visit David’s memorial bench outside of Nutting Hall often. It is not far from my office in the Memorial Union and is a wonderful space for quiet reflection and prayer. He is still a part of campus and that is comforting. UMaine will not forget him. I trained for this hike for over six months, and while I had challenges to overcome in my training both physical and psychological, I learned early on that keeping David in my thoughts and my heart would allow me to overcome any obstacles in my way. From what I know of him, David would never give up in the face of adversity so how could I. The hike itself was challenging but not overly, due in large part to the training. The ceremony at the summit was the real challenge. It was an emotional experience that I did not completely anticipate. Words failed me then. I didn’t have the words because I feel the loss. I am speechless and I grieve. I grieve for someone that I never knew but now I feel I know well, an old friend. Please accept my deepest condolences for your sacrifice. David is a hero I will never forget. Thank you We loved him . Thank you ! In remembrance of the events of 9/11 and celebration of what would have been his 35th birthday, I carried SSG David M. Veverka’s memorial stone on a traverse of Katahdin. I was incredibly lucky to have had Dave as a close friend in college and knew him best through his love of the outdoors. There are many times on hikes or kayak trips that I fondly remember his road trip quizzes on identifying trees or birds along the way. He was a natural teacher and people gravitated to him. Our senior year, Dave was selected as a National Science Foundation teaching fellow and was thrilled to be working with kids. His careful and considered manner always brought order to chaos, whether it was planning a trip or explaining complex concepts to students, but it was his enthusiasm that was contagious. Few people could make studying the effects of forestry practices on small mammal habitats sound compelling but Dave did. Throughout the summer his SUV would have a faint odor of peanut butter and a light dusting of the powder he used to track their trails through the brush. I doubt you could find anyone that would approach those midnight trap runs in the rain and dark with as much energy as Dave; whatever he did, he did his best. When Dave was promoted to SSG, I remember him being ready for the challenge, but that he felt a deep responsibility to the men he would be serving with. His time at Arlington had given him a deeper understanding of the cost of war than most. At Dave’s memorial service and the dedication of his tree at UMaine, I was amazed at the breadth of people attending. Dave had a unique way of finding common ground with people of all types and earning their respect. I think he would have enjoyed celebrating his birthday this way and would have approached the trail miles with equal parts enthusiasm and planning. There were several points in the hike that the footing became precarious or the heights overwhelming and the weight of Dave’s stone in my pack felt very grounding, something I was used to feeling when Dave was here with us. Whether it was as a soldier, a student, or as a friend, Dave was one of the best and he is missed immensely. I took great pride in honoring the memory of David Veverka by carrying his stone to the top of Cadillac Mountain. Dave and I were in the same major at the University of Maine, we rented a house together for a year, and we deployed together to Iraq. While hiking, I reflected on the type of person he was, and the times we shared together. He loved nature. He was competitive. He always had sound, brotherly advice that he shared with me. He strived for excellence in all that he did. Dave was like a big brother to me. On my 21st birthday, he refused to let me stay home to do homework, even if it was a Monday night! About 5 minutes later, Dave was knocking on my door and all but kidnapped me! He explained how we needed to go to Applebee’s in Bangor because that was the only place around that served Killian’s Irish Red on tap. Then he proceeded to take me to a bar, so I could order a drink there. That’s the type of man’s man that he was. The last time I spoke to Dave was before his final mission. We were sitting on the steps outside of my room around dusk. We were discussing how our friends would be graduating college at the end of the week, and how he looked forward to finishing our degrees together when we returned. Dave truly was a great person, and is greatly missed. His memory will never be forgotten. I love you like a brother. After I walked up the mountain and spoke about your son David, I realized Bradbury mountain was literally nothing compared to just a day of what he had to go through. He knew his life was on the line when he signed up for his job but he preceded on for the good of our country. David seems like he had that kind of attitude, to never give up and keep going on no matter what happened. Playing on a basketball team that never won he already knew what that was like but he still kept on playing. As I said on the top of the mountain, I am very glad that men like David serve in our army and give their lives for the good of us because there are not very many people willing to serve for our country. It takes a lot of courage. I learned that life is very special and it can be taken from you in an instant and that without people like your son our lives would not be the same and our world would be very different. Carrying the stone that represented David was an honor and I am glad that I was given the chance to do so. It helped me think a lot about being able to make the world a better place and helping others. Ssgt. David M. Veverka is a man I will never forget. Your son’s life has deeply impacted my own. From the first words I read about David I felt an immediate connection to him. -From his love of nature and animals to his adventurous spirit and his ability to talk to just about anyone. My journey “with” David started before I ever reached Baxter State Park for Memorial weekend. For 4 months I absorbed as much as I could about your David. I even had a chance to tell third graders at B.R.E.S about his life, service, and sacrifice. While preparing for the mountain, I hiked with a heavy backpack and soon realized May 6th 2016 was here. This day marked 10 years since he had passed. I knew I had to hike and began the 7 mile journey with thoughts of him with me. I took in all the nature around me and imagined what he would say about the different animals I saw along the way. On another day my son and I moved his basketball hoop and discovered a mouse with a bunch of her babies attached underneath. We quickly sprang into action to help her. She was terrified trying to gather her babies. One itty bitty baby was left behind so I put on gloves, picked it up, and brought it to the hole she ran into. After this mini rescue mission I laughed at this whole ordeal because if this mouse was in the house I would have killed it. I started laughing at the great lengths we went to, to help this little mouse. I quickly thought of David’s change of heart after studying field mice. He sent home his guns and stopped hunting! The Owl trail Hike with TSP was strenuous for me and I had to stop several times. Each time I looked into the woods to focus on the nature around me. I thought it was strange that we didn’t hear birds or red squirrels protesting our attendance. My legs began to fail me- I started feeling defeated! The strong woman and a Marine behind me took some of my gear to help. Eventually I ditched the backpack and just carried David’s stone and some water. I had to continue! This would not have been possible without their assistance and reminder that “No man is left behind”! It rained for the entire four hours up to the summit. I continually thought of David and still thought it was strange that in four hours I had only heard one bird. After we shared the memories of our Maine Heroes we reached the top and once again took out the stones as well as the American flag. It was extremely foggy so we had no view except for each other and the stones. All of a sudden a little bird flew out of the fog and right over the stones. Our heroes got, what I called, a fly over! Probably no one else thought much of it but I did and I think David would. On the ride back to Camp emotions swept over me. The pain in my body, I knew, didn’t compare to the pain you all feel. I realized I was going to have to return his stone and I cried because I didn’t want to let it go. I felt silly because it was a stone and quickly realized it was okay because I can always keep his memories with me. How could a man I’ve never met make me feel this way? It is profound! David studied ecology and came to appreciate the life of even little field mice- He even rescued a seal once. He served on The Old Guard at Arlington- While in Iraq he saved his Gunners life with his own -to him all life is precious. I left the military with some disabilities but I still have my life. David knew at 25 how precious life was and I think we all have something we can learn from him. Everyday we need to make the most of life and do what we can,while we can. Slow down and take in what is around us -appreciate the little things and live a life of gratitude and service to others. ” Defending freedom in its hour of maximum danger. I do not shrink from this responsibility- I welcome it… The energy, the faith, the devotion which we bring to this endeavor will light our country and all who serve it- and the glow from that fire can truly light the world. And so, my fellow Americans: Ask not what your country can do for you – Ask what you can do for your country” Your community -the person next to you. I believe David would encourage this, I believe this is was what he was made of! Let your life be worthy of the sacrifices! David Veverka you will not be forgotten! He is a pretty stinkin’ cool guy. Every story that I heard about him made me crack a smile and laugh. It is easy to see the love he left behind for everyone he knew and the best part about that is that he continues to do just that from the other side. I was pretty nervous about this hike. It was my first big event with the Summit Project and David was the first stone I had ever had the honor of carrying with me. Initially I requested to carry Dale Kelly. He was my Dad’s best friend in the Guard. I have grown up hearing stories about Dale and his dorky quirks and I was excited to summit with Dale in my pack. When David Cote asked me if I would like the opportunity to carry the stone of the other soldier lost alongside Dale that day in Irag I was taken aback… I didn’t know that the Guard had lost another man that day. It broke my heart. Every year on May 6th I think of Dale. I think about his sacrifice and how much he is missed. I watch my Dad say a little joke up to the sky about Monty Python and I send a little thank you of my own. I cannot find the words to express how much it means to me to have another soldier to thank on that day. David, thank you. David’s passion for beer, nature, and country will live on in my heart. I am thankful for the opportunity you’ve given me to get to know this handsome, intelligent, brave, and hilarious young man. I hope that the days get a little lighter as time goes on because he is probably holding a beer waiting for all of us up there. I was honored to have the opportunity to carry David’s stone up Streaked Mountain. It was a long and tiring hike but nothing compares to what David did for our whole country. Knowing everything he sacrificed for our country made me realize how unselfish and strong of a person he must have been. I loved reading about David and how he found a love for hiking and kayaking, and it made me super excited that we were remembering him the best way possible by doing something he really enjoyed. Reading about David’s past brought me joy knowing that he spent his childhood living his life to the fullest. He spent most of his time outdoors, at summer camps, or with his family. I think those are the best childhood memories possible. David was a brave man for putting his own life on the line to save others and I think that is something to be very proud of. Although he lived a very short life, everyone will always remember him for everything he has done for our country. I would have loved to meet David. He seemed like a ball of joy that lightened everyone’s day no matter how bad it could possibly be. I would like to thank you for giving me the privilege to bring David’s stone up Streaked Mountain with me. It really made me realize how lucky I am to live in a country and be protected by such amazing people like David. David will be remembered by many for how unselfish and hardworking he was. I can’t even imagine how much courage it must take someone to drop everything and go fight for other people’s freedom and safety. No words can explain how thankful I am for everything David has done and the amount of time he had to spend away from all of you to serve his country. Thank you again for allowing me to bring David’s stone with me on such an amazing and fun hike. I had the honor and privilege today to carry SSG Veverka’s stone at the Portland Jetport. I was in Diwaniyah several times in 2005 myself. We actually have a family portrait made by an artist from that area (I gave him a photo and he put it on canvas). David’s story demonstrated his dedication to duty and his country. I work at the MEPS where the stones are kept. Learning his story has given me one more stone to visit daily while at work. It was a great honor to carry David’s stone up the Owl Trail at Baxter State Park this month. I had no idea what i was to experience during the weekend, and was amazed at the level of reverence that these fallen soldiers and sailors received. I don’t want this to sound political, because it’s not meant to be, but it seems I hear a lot about how we need more soldiers to fight,but not enough about our fallen military people. While I was climbing with David’s stone that reverence was always with me, always in the forefront. During the hike I thought about David and how much he fit into his short life,from UMO to San Diego to the military.He was passionate about kayaking and Marine Biology. I’m sure he would have loved the view from the top of the Owl. I misjudged my level of fitness,and the difficulty of the Owl Trail, so quickly fell behind the pace. My team never left me behind and one team member offered to carry David’s stone to lighten my load. Our focus was always on getting David’s stone to the top, so due to time constraints my daughter and I passed my son’s and David’s stones on to fellow climbers, and we returned to base with another team. I would have loved to have finished the climb, but was at peace knowing David made it all the way. Thank You for allowing me to get to know David. Whenever I have a dark beer in the future I will think of David and toast his life. and his sacrifice. I had the honor of carrying David’s stone on a hike up Cadillac Mountain this month. I was saddened to learn of the many things that we had in common. We were born just about a year apart and he was from PA while I am from NY. We also had a love for working with children and both attended the University of Maine in Orono. So while I never knew David I feel like we would’ve gotten along. I thank him for his service and I want the family to know that I teach U.S. History and Civics and plan on talking about him and his service every year. This whole experience has inspired me to have my students find out more about the soldiers in our local area. I also had the opportunity this week to visit his grave in Arlington. His memory will live on in my classroom. I would like to begin by saying that this was my first experience being involved with TSP. I can say that this experience far exceeded anything that I imaged still existed in an organization. This project puts remembrance and honoring the Gold Star family before all else. I began this event thinking that I would get a chance to hike with some old friends and others that shared my love of the outdoors. My first indication that this would be something a little different was when I received instructions and a list of responsibilities for hikers. I was asked if there was a particular stone that I would like to request. I am fairly new to the area, but being a veteran was happy to remember any one of Maine’s Fallen Heroes being honored. I was assigned a stone and asked, as part of one of my hiker responsibilities, to investigate the story of SSG David Veverka. I immediately began researching David’s story. The first thing that I noticed about his story, that made an instant connection, was that he was also a transplant to this area. David was originally from Jamestown, PA. This instant connection prompted me to want to know more. David was born in 1980, I have a brother and a brother-in-law both born that year. This made David more real to me, to think of him more like my or my wife’s little brother. The more I learned about his life and his service the more connected I really started to feel. I found this sense of connection so unbelievably compelling. I would later find out that there was no coincidence in these events. Many of the hikers were certain they understood this phenomenon. They explained to me that “Hikers don’t really choose a stone; the stone chooses the hiker”. I will have to say that I am now a believer in that small but most powerful truth. I thought that I had prepared myself for this event. I looked forward to the camping, hiking, and potential for camaraderie. The morning of the hike started with a lot of friendly faced hikers meeting in a large tent for a safety brief and to retrieve the stones of the Heroes each of us would have the privilege to honor. Once we arrived at the trailhead to start the hike, I was already feeling comfortable around my fellow hiking team members. The trail was more than a hike. Several of the members of my team were Gold Star family members, themselves. They told stories about previous hikes with TSP and spoke animatedly about their fallen family members. Upon reaching the summit, we circled up to share the stories of those Heroes who’s stones we had each carried. As the stories went from hiker to hiker, and stone to stone, I began to really be overcome by emotions. I started remembering more and more things that David and I had in common, and I began to miss a person whom I had never really met. When it came my turn to share David’s story, and talk about how it his story and sacrifice moved me, I felt even more compelled to make sure David was remembered. I couldn’t really begin to explain it if I had not experienced it for myself. But I now feel compelled, honored, and privileged to be part of this remembrance. This was a living memorial to that brave few who have made the ultimate sacrifice for millions of others they would never meet or know. I now, and will always keep this TSP @ ANP event in my heart. I am so privileged and humbled to also, from this point forward, keep a little bit of David Veverka’s story and life with me. I will share it with others, so that they might consider doing the same. Thank you, TSP, TSP hikers, Team Kebo, and the countless others that made this event so memorable for me. I would also like to say that I am completely amazed and humbled by having met others that knew David’s story and chose to share it with me. David, I wish we could have met in person and enjoyed a beer and a conversation. I am appreciative of your sacrifice, and honored to still have gotten to know you a little. My name is Justin Cloukey and on Memorial Day, 2018, I had the honor to carry the stone and story of David. I have been with The Summit Project for several years; however, this hike was special. Not only did I learn about my and David’s connection at UMaine, but also experience a TSP event as a team lead. I recall my initial angst when I was confirmed as team lead, but instead of dwelling on the unknown, I did what I’m sure David would do; I started my prep and went to work. I reflected on the amount of hard work and dedication it must have taken for David to earn his way onto the Army Drill Team and used this as ‘the bar’ for my level of expectation. I knew I wanted to lead but also allow for individualization as these events have a tendency to change people; lead by example but also maintain extremely high standards. The weekend proceeded as it has the last 3 years with my wife, 2 children and myself greeting the convoy at their last pit stop and gave refreshments to the group. We followed the convoy to base camp where I met my team. We made small talk and discussed the timeline of events, but I had a great feeling about the group; we were prepared physically and mentally (the emotional part was yet to be determined). The weight of David’s stone was notable as I packed my bag for the hike. I share David’s love for hiking, kayaking and outdoor life. As we made our way up the mountain, I frequently thought about David’s leadership capabilities. Was I doing enough? Could I be doing something better? I was frequently talking with the assistant team lead and team members to ensure the mission was being carried out, while taking my own time to appreciate David. I couldn’t help but feel I was being guided in the level of communication required to run the team effectively. I was impressed with the team’s ability to rally around one another to ensure all were successful. During the summit ceremony, I spoke of my connection to David through UMaine. We both attended the school at the same time and were supposed to graduate on the same day. I’m sure I saw David on campus and were I to have met him, never would have guessed this would be the connection we have today…it’s a burden we all wish we never had to carry. This realization had a profound impact on me as I went on to marry, build a career and have a family after college. I’m not one to take anything for granted, but this made me appreciate what I have even more. After the hike was complete and the team was back at base camp, I celebrated David and my newfound friends with a dark beer in his honor (Bear Brew was a bit of a drive away). In just 6 hours, my team had went from a group of strangers to a family, laughing, telling stories and making memories. David continues to have a positive impact on those connected to him. I like to think I am a better leader because of David and his values and know I am a better person. I thank David for his service and thank my team for the incredible experience. I had the honor of carrying Army Staff Sgt David Veverka’s stone during the Acadia National Park hike last weekend. As I researched David’s life in preparation for the hike, I was struck most by his character. That is what I chose to share with my fellow hikers. I told them how about how he never won a basketball game in high school but worked as hard as if he were winning each time. I told them about him following in the footsteps of his grandfathers’ and father’s service to our country. I also told them how he ‘seized the day’ in all that he did and how he saved a life the day he died. I was particularly impacted by how David essentially began his military career honoring the fallen at Arlington National Cemetery and is now buried there. I encouraged others to spend time at Arlington if they haven’t done so. It is a powerful and incredibly humbling place. To further honor David, I plan to visit him there. I love my home state of Maine and it always makes me happy when others love it, too. It made me smile to read about David’s studies at UMO, his love of animals, hiking and kayaking. My hope is that he carried Maine memories to Iraq and that those memories helped him during his time there. Thank you for the privilege of carrying David’s stone and story.